This work takes us back nearly sixty years, to a time when what is now a movement of universal significance was in its infancy. Hegel and the Revolution of 1848; these are the points of departure. To the former, we owe the philosophic form of the socialist doctrine, to the latter, its practical activity as a movement. In the midst of the turmoil and strife and apparent defeat of those days two men, Marx and Engels, exiled and without influence, betook themselves to their books and began laboriously to fashion the form and doctrine of the most powerful intellectual and political movement of all time. To the task they brought genius, scholarship, and a capacity for hard work and patient research. In each of these qualities they were supreme. Marx possessed a colossal mind; no thinker upon social subjects, not even Herbert Spencer, has been his superior, for the lonely socialist could claim a comprehensiveness, a grasp of relations and a power of generalization, together with a boldness of conception, which place him in a class by himself. Engels was the able co-adjutor and co-worker with Marx. He was a deep and acute thinker, a most patient investigator, a careful writer. More practical than his friend, he was better able to cope with material problems, and his advice and his purse were always at the disposal of Marx. The latter could hardly have worked under more discouraging conditions. Poverty, inadequate opportunities, lack of stimulating companionship, and the complete absence of any kind of encouragement and such sympathy as a man of his affectionate temperament craved fell to his lot. His most learned works were written for groups of workingmen, his most laborious efforts were made without the slightest hope of recognition from the learned and the powerful. All through these years Engels remained his faithful friend, and helped him over many hard places when family troubles and straitened circumstances pressed upon the old revolutionist. This work is Engels' testimony with regard to the method employed by them in arriving at their philosophical conclusions. 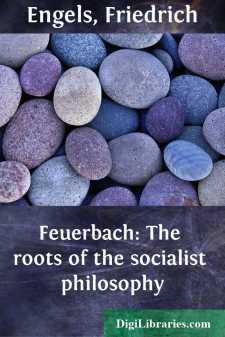 It is the statement of the philosophical foundations of modern socialism by one who helped to lay them; it is an old man's account of the case upon the preparation of which he has spent his entire life, for, this work, short as it is, represents the results of forty years of toil and persevering effort. As the "Communist Manifesto" was a gage flung with all the impetuosity of youthful impatience into the face of constituted authority, so this is the deliberate statement of the veteran, who has learned the game too well to leave any openings, and proceeds to the demolition of pet opinions in a quiet, deadly and deliberate fashion. Step by step, the argument is built up. The ghosts of old controversies long since buried are raised, to show how the doctrine imperishably associated with the names of Marx and Engels came into existence; the "Young Hegelians," the "Tuebingen School," and finally Feuerbach himself are summoned from the grave to which the Revolution of 1848 had consigned them. Still, ancient history as these controversies are from the German standpoint, such is the backwardness of philosophy among English-speaking peoples, that we find Engels exposing again and again fallacies which persist even in our time, and ridiculing sentiments which we receive with approbation in our political assemblies, and with mute approval in our churches and conventicles. The anti-religious note is noticeable throughout, in itself an echo of controversies long past, when the arguments of the critics of the Bible were creating now fury, now dismay, throughout Christendom, before the Higher Criticism had become respected, and before soi-disant sceptics could continue to go solemnly to church.